Allan J. McIntyre Fine Art is an Internet business specializing in fine prints and works of art on paper created before 1950 that interpret the American Southwest and the greater American West. In adjunct to normal business operations we are attempting to develop a more thorough understanding of artists who worked and lived in Arizona in the nineteenth and early twentieth century's. Consideration is given to learning about and acquiring information on artists who resided in the state of Arizona, but due to geographic location and the inability to properly market their art, have been eclipsed by others. It is our hope to fill in yet another corner of American regional art. 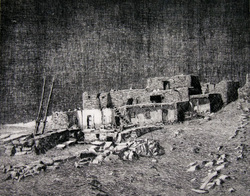 Although a great deal of literature has been produced on early Northern New Mexican artists and printmakers who worked in the Santa Fe and Taos areas, similar research and publications is sadly lacking for Arizona artists. We extend our interest of the desert regions of Arizona, California, Colorado, New Mexico, Texas, and Utah to the more damp and foggy climes of the San Francisco Bay Area. Within that region, we actively seek and sell artists, such as John Haley, Jennie Lewis, Marguerite Redman Dorgeloh, Clay Spohn, et. al. Nationally we collect American artists working in the various New Deal federal arts programs of the 1930's and early 1940's (for example PWAP, TRAP, and WPA FAP prints) and to those who used their skills in their expression of political discontent or social commentary. For example, George Biddle, Jacob Burck, H. Mallette Dean, Stevan Dohanos, Hugo Gellert, William Gropper, J. Jay McVicker, Mildred Rackley, Harry Sternberg, and Anthony Velonis, among others. Having been involved with archaeology and anthropology for a number of decades we have developed a tremendous interest in Native American ethnographic art of the American Southwest and Northern Mexico. To avoid being pigeon-holed into one regional area, or particular category, ethnographic objects of all forms and types may be found on the site or found though email inquiry.